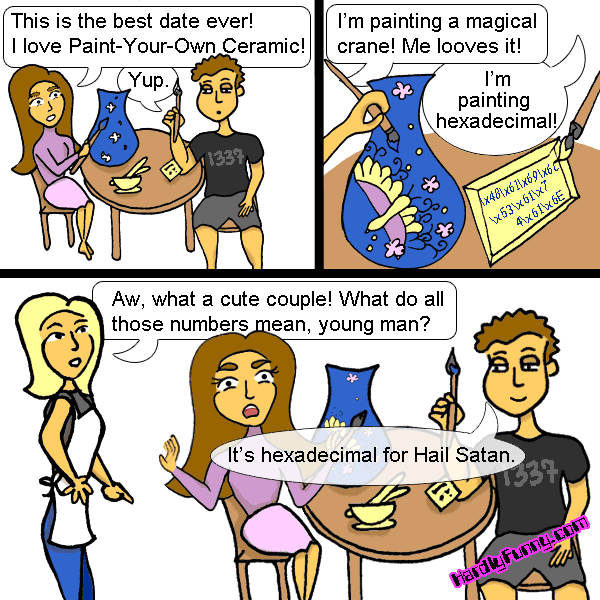 Now we have a personalized-by-Randall ceramic candle holder that reads Hail Satan in hexadecimal. Not good. Not good at all. I regret taking Randall there but it’s my favorite place and I’m counting down until our next visit on Valentines Day! This entry was posted in Posts and tagged date night, Hexadecimal, Randall by Samantha. Bookmark the permalink. This is very spooky. This is what happened when I took my wife on our first date. Except I wrote her name in hexadecimal (ascii) in a mug. That’s sweet of you to write her name and not Hail Satan! Randall had just watched a relevant Southpark episode and thought it would be funny to do it.